This version of the Sinn 556 is marked "I" for Indices (the dial has no numerals). 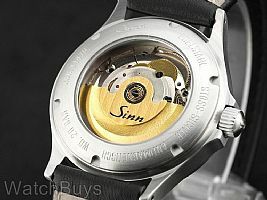 The difference from these clocks is that Sinn has removed all numerals from this watch and replaced them with indices. This clean design is a primary reason that so many choose this watch as their daily wear timepiece. The Sinn 556 I features a case size at 38.5 mm which is satinized. This finish results in a slightly more polished look while at the same time retaining some characteristics of a matte finish. Verified Owner Comments: This watch is great! I went with the 556i out of a few other options, the 556a and the 856, because I thought it was more versatile. The gloss black dial looks deep and the indices really stand out. The legibility on this piece is incredible and it can be dressed up or down all the same. I put it on a brown strap and wear it as my everyday watch with business casual attire and it has never felt out of place. Verified Owner Comments: Purchased this item for my son for college graduation. Great quality for the money and he is very happy with it. "Rail Road Pocket Watch Guy"
Verified Owner Comments: Been a rail road pocket watch guy for most of adult life. Accuracy, elegance, rugged, durable and gives me the one thing I carry it for.....what time is it. Been looking for wrist watch which could give me accurate time. Love mechanical watches don’t have to mess with batteries. 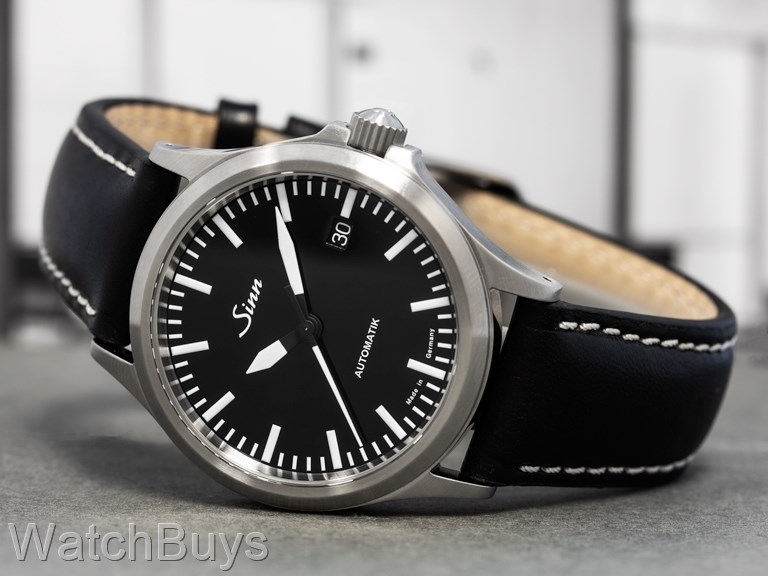 Found it in this affordable Sinn model. Accurate, elegant and wearable. Great buy and WatchBuys really great service. Thanks Sinn and WatchBuys. "First Sinn but not my last"
Verified Owner Comments: This is my first Sinn and I must say I am highly impressed. I was very leery about buying online, but the gentlemen at Watchbuys.com are amazing. They actually took the time to answer all my questions and then some. They so far have provided me with some if the best customer service i have had to date. The watch itself came in perfect condition and keeps great time. I would highly recommend this watch to anyone looking for a tool watch. I was also concerned about the lume as everyone knocks the lume on this watch. I must say it is not as bright as my Orange Monster, but it does make my Hamilton look bad. If i charge it before bed it will last all night, and it will be very dim when I get up in the morning. This maybe my first Sinn, but certainly not my last. Verified Owner Comments: I love this watch! Very nice watch. Dial is unique: White index really stands out against gloss black dial. Stainless case is beautifully styled. At 38.5 mm the watch wears a little smaller than the 40 mm plus watches that are so common today, but this is fine with my 6.5 wrist. Verified Owner Comments: This watch lives up to its billing. Fantastic deep black dial. Beautiful contrasting white hands and time markers. Love the legibility. High quality fit and finish. Great craftsmanship. Bonded with it straight away and have enjoyed wearing it every minute since purchasing it three months ago. Verified Owner Comments: I love the Sinn 556i ! Verified Owner Comments: Great watch! Verified Owner Comments: The German version of the Rolex Explorer. Amazing watch. Definitely a keeper! Verified Owner Comments: I was researching quite a lot before buying my first automatic watch, and I was left not disappointed. The watch looks and wears really nice on my 16,5cm wrist. Buying experience form Watchbuys was pleasant too. Cons - the front sapphire crystal is a fingerprint magnet because of the antireflective coating. Need constantly wipe it with a cloth. Verified Owner Comments: I had been looking to secure a signature piece of my watch collection for a few months, which was largely made up of budget Seiko/Orient/Casio items. Something with more polished construction and finishing, yet a simple, legible design that is fitting casually and professionally. The 556i fulfills all of the above, has a respected ETA movement, incredible deep black dial and is a great option for those looking at something in the confusing mid range market. Great experience with watchbuys as well, they followed up by phone throughout the shipping process, felt more than an anonymous online transaction! Verified Owner Comments: I love the fact that this watch is under 40mm. It is practical and comfortable for everyday wear, unlike the 40mm+ watches. Even with a 7.5 inch wrist, it is bold enough to be noticed. I love the simple beauty of this watch, along with the solid, quality build. Shipping was extremely frustrating with FedEx. I know I gave Rob some angst about it, but he was very responsive. Good customer service. Verified Owner Comments: This watch has a simple kind of beauty with its no nonsense dial and easily readable hands. The dial is a rich glossy black that along with the contrast from the white hands and indices allow easy readability at just a glance even in the dark when relying on the lume. Verified Owner Comments: This turned out to be my grail watch though I didn't know until I owned it. Elegantly simple in design it looks evem better in person. It is exactly what it is claimed to be and doesn't pretend to be anything else. If this is your type of watch stye and mechanics-wise you will be exceediingly happy with the purchase. Verified Owner Comments: The watch arrived in perfect condition and is a work of art. Finish is flawless. Worn for about two weeks and is keeping time to about 3-4 seconds per day (excellent timekeeping). BTW, FedEx messed-up Saturday delivery and WatchBuys secured a refund for the shipping charges. Excellent customer service. Very happy and will gladly be a repeat customer. Verified Owner Comments: The watch is as advertised. It keeps good time and looks amazing (In my opinion). Verified Owner Comments: The 556 is the perfect watch. It goes great with jeans but can be worn with a suit too. Shipping was fast and the guys at watchbuys made it an easy transaction. Will be sure to buy from them in the future. Verified Owner Comments: I waited a while to get this watch. Over a year to be specific. As a relative newbie to horology, the first nice watch I purchased was a Fortis B-42. While it is certainly a hell of a watch for the money, I soon found it to be too large, loud and cumbersome for me. It took some time to recognize and appreciate the elegance in a simple, well designed timepiece in a size that suited me. Enter the 556i. At 38.5 millimeters, it really feels at home on my wrist and is a pleasure to wear everyday. I opted for the black leather strap, which in my opinion looks just at home with a t-shirt and a pair of jeans as it does a suit. Along with my Omega Speedmaster Professional and Casio GW-5000 G-Shock, the 556i rounds out my small collection beautifully. Highly recommended! Verified Owner Comments: Dress, casual, swim, run, tool, this watch does it all! Looks good in a suit, looks good on a t-shirt. Would recommend and buy again in a heart beat. Verified Owner Comments: I was hesitant about the 38.5 mm size of this watch as I thought it might be too small. Its a beautiful watch, and the size and weight ended up being perfect! "Good Value is an Understatement"
Verified Owner Comments: This was my first purchase over 300 dollars, so you can understand I was a bit hesitant. Rest assured the staff at watchbuys offer great service and make sure the process is as smooth as possible. The best part is you get the watch the very next day. I am planning on buying another piece next year. (Only qualm I have about the watch is that it is so hard to decide the i and a versions. Also the watch looks much better on a Nato Strap). "I love my SINN 556"
Verified Owner Comments: I fell in love with this watch the moment I opened the box. The attention to detail is fabulous, I can read the time under any conditions without difficulty. The accuracy of the movement has surprised me. I find the average to be about + 3-4 seconds per day. I would have preferred a softer feeling leather band but that would be a simple fix. I must also comment on the absolutely excellent customer service. I will definitely purchase another watch from watchbuys again. I highly recommend. Verified Owner Comments: This is a solid, well manufactured and very attractive timepiece. I get multiple compliments on it a day. The size is perfect for my rather smaller wrist- it's not too big, not too small, just right. I still haven't gotten over the build quality and how attractive this watch is. I've worn this to work, casual events, and a wedding- you can literally dress this watch as up or down as you like. 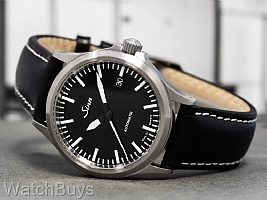 I would definitely recommend this watch and the Sinn brand to others. Purchasing through WatchBuys was painless and professional. "Great Watch & Buying Experience"
Verified Owner Comments: Lets start off by saying that the buying experience was excellent as was follow up inquiry that I made. I was able to change to a smaller strap at the last minute. As has been said, the watch looks better in person than the photos show. The white markers and hands really pop against the black gloss face. The size is perfect for my thin wrists. This watch will most likely be making a trip to RGM for regulation as it is running +14 sec/day at this time after the 8/10 week settling time has passed. Verified Owner Comments: After many months of research, I decided on getting the 556I. Customer service was excellent, and the watch shipped in a few days. It's beautiful, simple, clean and classic. I got a call a few days later asking if everything was good with the watch, I thought that was a nice touch. Great experience with Watchbuys, I've already recommended to friends and I look forward to my next purchase. Verified Owner Comments: Great looking watch, simple yet elegant design. solid built. Ordering process very easy with delivery time as promised. Verified Owner Comments: It's been 3 weeks since I've purchased my Sinn 556i. At no time since have felt any thing close to "buyers remorse". My trusty 24 year old quartz Omega and 14 year old quartz Tag have become "second class citizens", pushed to the back of the drawer. There's something satisfying about owning a true, well made mechanical watch. WatchBuys sent my my merchandise quickly and efficiently. They also have a real time email service that is quick to respond to specific questions that may arise. I received my 556i and couldn't be happier with the purchase. The watch looks better on the wrist than any picture can portray. It'll be my daily beater. My speedy pro is having a tough time getting some wrist time! Verified Owner Comments: Beautifully well built watch . The dial and its simplicity and legibility of the index markers and hands are stunning. Quality leather band. Very accurate. You won't regret the purchase. Verified Owner Comments: Fantastic build quality, I'm very satisfied with this watch. Simple design will look current for many years. Strap seems to be well built and has a nice leather smell. I have small wrists and it doesn't look too big. Recommended. Verified Owner Comments: Everything advertised and more. Fantastic watch and even better retailer. Superior customer service from the informational "Chat" feature to post order call back and upgraded shipping. A delighted customer and will highly recommend. Verified Owner Comments: I am extremely pleased with my purchase of a Sinn 556 I. The watch is even better looking than in the pictures and reviews that caused me to buy it. WatchBuys customer service personnel are extremely knowledgeable and helpful – no high pressure sales pitch. All my questions prior to and after the sale were thoroughly answered and the watch was sent out for prompt delivery. This will not be my last purchase from this company. "Quality, versatility, elegance all in one package"
Verified Owner Comments: This is a watch that fits in really well in a business casual setting, weekend BBQ party, or formal / suit & tie environment. No tegimented case or other technology is included, however. But I LOVE its simple, understated design that screams quality all around. This is my first Sinn purchase, and likely it won't be my last. Verified Owner Comments: This watch has a super clean design and a flawless finish. I like the satinized case a lot as well as the focus on telling the time without any distractions. Turning the watch over gives you a look into the 25 jewel movement through a sapphire back. All in all this is a tremendously satisfying watch to own. "Great watch and great customer service"
Verified Owner Comments: Would I like a tegimented watch? Sure, but aesthetically this is in my opinion the best looking watch out there. I love the look and feel. Customer service was top notch too, it was on back order for a week but they received a shipment from Sinn early and promptly gave me a phone call to let me know it was on its way, explain the return policy, and ask if I had any questions. I'll definitely order from them again. Verified Owner Comments: Great watch, reminds me of the clocks at a German Airport. Little on the small side at 38.5 mm, but outstanding build quality makes up for it. "I wish I would have found you guys sooner"
Verified Owner Comments: It would have saved me a ton of money over the years. I am completely satisfied with the watch and WatchBuys support. Perfekt!!! Verified Owner Comments: Purchased the Sinn 556 I in Canada. WatchBuys staff were excellent. I have received many comments on my Sinn 556 I. It is very comfortable (easily wearable with a dress shirt cuff) and is a classic design that looks good in a professional workplace, or just out on a boat. Also it easily readable at night. Highly recommend! WatchBuys was great, professional, pleasant to talk with, performed all tasks as scheduled, and very communicative. Packaging, first-rate. The watch itself is exactly as hoped - classic, elegant, and well-designed and made. Verified Owner Comments: This watch is beautiful with the super black face and bright white contrast of the hands and markings. Verified Owner Comments: Follow up on a 556 I got not too long ago. Still love it. Am going to start selling all my other watches, no need for them any more. Picked up a Sinn rubber strap with deployment. The 556 looks great with it. It's all the watch I need. Verified Owner Comments: I have been intrigued by Sinn's for a few years now, and finally decided to purchase a 556. Wow! What a bargain. This watch just reeks quality, far beyond other brands at this price point. One of the top levels of ETA's tiers for their calibres, I was impressed that it even included blued screws. This is unheard of at this level. Verified Owner Comments: A beauty. My eyes are not the best and I have no problem reading the numbers. Verified Owner Comments: I couldn't be happier with the purchase. I wanted the metal bracelet but it was sold out. I have to say it looks great on the black leather strap as well. It shows off the case nicely and gives it the appearance of greater thickness. It fits my 6.75" wrist perfectly. It also looks great on a brown strap. As soon as the metal bracelet becomes available, I'm all over it! Verified Owner Comments: This is a beautifully made and elegant watch. I'm a pretty big guy, but the relatively small diameter still looks appropriately sized. I'm very impressed by how good the piece looks, yet it's not in any way ostentatious or fussy. The transparent back is fascinating as well. Verified Owner Comments: Very happy with the quality of this watch. Sinn has gone back to using top grade ETA 2824-2 movements in the 556, and mine keeps excellent time for an automatic. The level of finishing on the movement is excellent. Don't like the strap that came with it and couldn't justify the cost of a bracelet, but the strap is easy to change and you can always buy a bracelet from WatchBuys later. I have a green zulu and a brown di modell jumbo that both look very sporty with the 556. Verified Owner Comments: I just got a 556 after the holidays, and I can't stop wearing it! I have TAGs and an Oris, too, but this watch is different from Swiss watches and has so much character. It has a really solid, Teutonic feel to it. The dial is extremely easy to read and the nighttime lume is also quite good. So far over the past couple weeks, it is keeping bang-on time as well. The 556 is a solid watch and a great value. It has a definite feel of no-nonsense quality, durability, and masculinity, and a classic design. Though it is "only" 38.5mm in diameter, beware that this watch doesn't wear like a midsize watch it wears bigger. I have small 6 1/4" wrists and had to drill an extra hole in the leather strap. Now if Sinn could only make a 556 in 36mm! "Classic style, great wearing watch"
Verified Owner Comments: It wears bigger than its 38.5mm. I have a 7.25'' wrist and it's a perfect size. Verified Owner Comments: I've had my 556 for a few months now. Works like a champ and looks great with any wardrobe, from the gym to business meetings. Negative: Scratches on bezel are highlighted by finish. Still not a deal breaker. Verified Owner Comments: Gorgeous watch at a fantastic price. However beware the satinized finish isn't very durable. The 316L steel is quite soft and the grain in the satinized finsh will show even the slightest scratches, ESP those that run perpendicular to the grain. Also the hard edges around the bezel and case ding easily owing to their sharpness. Still it's a great watch at a reasonable price, no regrets. "Sinn 556 on Strap - Superb Value & Build"
Verified Owner Comments: I just received my first Sinn watch yesterday. The value of this watch is incredible. From the moment I took it out of the box I could tell that the build quality was that of watches that are much more expensive. This watch feels so solid on my wrist yet it is not over-sized. I do have a smaller wrist and this 38mm watch fits it perfectly. I would highly recommend this watch to anyone wanting a solid design, German craftsmanship/engineering, great value, small or medium sized wrist, someone maybe just getting into watch collecting and/or someone who desires a very legible and easy to read dial. I highly recommend it and you will be very pleased with this purchase as well. Verified Owner Comments: I have a collection of almost 40 watches and this is likely to become my everyday wear watch. This watch feels good on my wrist unlike some others that pinch or have sharp edges. The crown is set in such a way that it doesn't dig into my wrist when I flex my wrist. The black and white dial and hands present very well thus making this is an easy to read watch without my glasses. I am already receiving complements on my latest addition. The price point can't be beat for this timepiece. The crystal back is an added treat. This was my first WatchBuys purchase. They were patient, courteous and informative. I will buy from them again. Verified Owner Comments: This was one of the most pleasant surprizes I'v encountered in a long time.